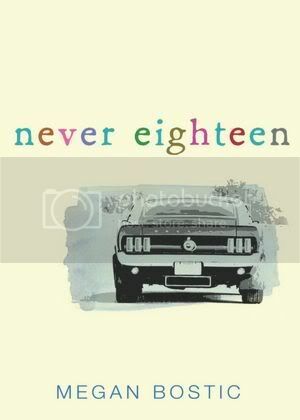 Never Eighteen by 2012 Debut Author Megan Bostic, is a touching story of friendship, love and loss. I really, really enjoyed reading this book, and read it in just a few hours time. It was a beautiful and touching read. The characters are wonderful. I really felt a connection with them, especially the main character, Austin. 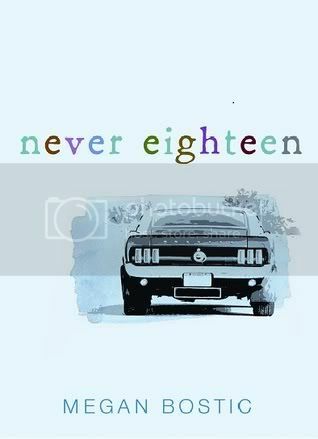 He knew his time left in the world was short, and he wanted to help the people he cared for with the problems in their lives, and to tie up a few of his own loose ends, before his time was up. We follow him on journey over a two day period, with the help of his best friend, Haylee, to help these people with the problems in their lives. I felt his love, his sadness, and sometimes his frustration. He had a wonderful support system, and you could definitely feel the love. I thought that was really great. The book is a very quick read, and the plot deals with something we can all relate to; loss. The writing was just beautiful, and heartbreaking. I was crying into my sleeve all through the end of the book. If a book can make me cry, that definitely says something. I love books that can get to me emotionally. The book definitely made me think, ‘What If?’. Overall, I really enjoyed reading this, and recommend to anyone that loves to have a good cry over a great book. I’m really looking forward to reading more of Mrs. Bostic’s books in the future! Happy Reading! Oh man, I really need to read this now. I love these kind of books that ruin me emotionally and considering this had you crying into your sleeve throughout the end... um, I'm preparing my heart to break already! Fantastic review, I'm bumping this on on my wishlist now! I have been craving this book..everything I have read about it has been great. I cant wait to finally read it! I've been on the fence about whether or not I want to read this one. Because I'm pretty sure I would be depressed at the end! I hope I end up braving the heartache, though, because it sounds REALLY good. Oh, this one looks really good. I'm so glad you liked it. Just thinking about it makes me sad, though. Thanks for the review! I have a love-hate-relationship with books that make me cry. One the one hand, it means that it's a really good book; but on the other hand, I usually prefer happy endings. Great review! This book definitely deals with things we can all relate to, especially those of us who have loved ones in our lives who have been affected by cancer. I can't wait to pick it up myself.